Award-winning director Ashutosh Gowariker is confident that his new film "Khelein Hum Jee Jaan Sey" on the Chittagong uprising would be an enlightening experience for people in the subcontinent as he himself was shocked to learn he knew nothing about it. "I was shocked that I did not know anything about it. So when I discovered this I thought I must express, meet and share with viewers that there was a revolution that we don't know anything about," Gowariker, who made the Oscar-nominated hit "Lagaan" and epic blockbuster "Jodhaa Akbar", told IANS on phone from Mumbai. For Gowariker "the most important thing" about his third foray into historical cinema "was that it was a revolution of such vastness and magnitude involving not one person but 64 revolutionaries led by Surjya Sen", a school teacher who carried out the Chittagong armoury raid in 1930 in British India. He is confident that the film, which opens worldwide Dec 3, would be of great interest to Indians at home and abroad despite the relative obscurity of the featured incident. "Absolutely," he said. "I mean Indians everywhere, even overseas Indians. I would say the entire subcontinent, including Pakistan and Bangladesh, because Chittagong is now in Bangladesh." Though historical cinema does "not necessarily" allow directors to work on a larger canvas, Gowariker says in his case "the themes have been such which lend themselves to having a scale." "Be it 'Lagaan' - though it's completely my imagination - about a small village standing up against British rule or 'Jodhaa Akbar' about a Mughal emperor, it automatically lends itself to grandeur." Similarly, "Khelein Hum..." about 64 people and five centres of British power naturally lends itself to scale. 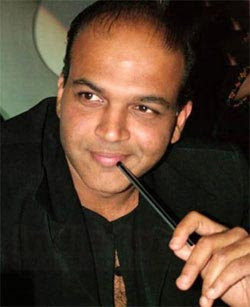 However, his third period film after "Lagaan" and "Jodhaa Akbar" can't be categorised as coincidence, Gowariker said. "Because when I look back it's the themes which have interested me. I think each theme required some kind of different era to tell that story. That's why each of these had these settings." "Khelein Hum..." takes its name from a revolutionary song featured prominently in Amitabh Bachchan's film "Main Azaad Hoon" because 56 of the 64 revolutionaries were teenagers, just 13-14-year-olds. "I was quite fascinated to know that at such a young age a kid was thinking about revolution and about the country. I wanted to reflect the spirit of these teenagers playing with their lives. And that aspect would be justified by the title." Gowariker said he "discovered the revolution" through Manini Chatterjee's book "Do And Die" and based the entire film on it as this is the only source about it. "In fact she is the daughter-in-law of Kalpana Datta, who was one of the key revolutionaries in Surjya Sen's group and so Manini has kind of first hand information about it through Kalpana." "Khelein Hum..." is both a commercial and an artistic film "as both go hand in hand," he says. "I would say both. If I have to make a revolution known to the world, it should be seen by more people." But unlike his previous films, this film does not have music by A.R. Rehman simply because "Rahman has been very busy since his Oscar march with international projects." "So I think it's completely unfair to expect him to continue doing Hindi films when he can actually explore a much wider horizon," Gowariker said. He picked Abhishek Bachchan and Deepika Padukone for these decidedly non-glamorous roles because "when I read the book, the image that kept forming in my mind was Abhishek and discovered that the quality of Surjya Sen's character aligned with Abhishek". "I had a feel for Deepika. And an uncanny part is she resembles the photographic evidence about Kalpana Datta." Gowariker says he did not actually shoot the film in Chittagong in neighbouring Bangladesh because the location that was there in the 1930s no longer exists in that shape.